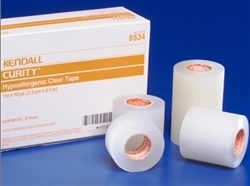 Kendall™ Curity Hypoallergenic Clear Tape is ideal for taping catheters, IV tubing, and securing dressings where a clear view of the site is required. The transparent tape adheres well to skin and tubing. It can be easily torn across or lengthwise to provide a custom fit for a variety of uses.